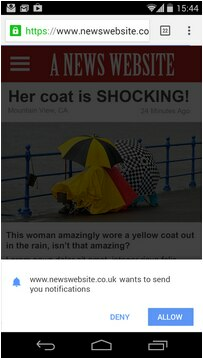 Why is asking for permission to send chrome push notifications so important? 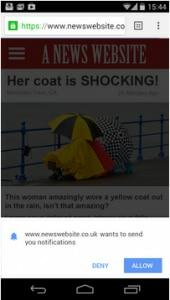 Web push notifications can be sent to a user only when you have his permission. In Chrome, if a user denies a website access to permission, the site will never be able to ask for the permission to that user again. Chrome is even planning to automatically deny permission prompts from websites whose prompts are largely ignored or dismissed by users. So, it becomes all the more important to show the permission prompt and ask for user’s permission at the right time. Ask for user’s permission only when he is willing to grant permission. So instead of showing the permission prompt directly, it would be better to ask for user’s intent first. For e.g The user should be asked if he would like to give permission to the site to send him regular updates/notifications. If he dismisses, he shouldn’t be asked for permission. If he allows, then only he should be shown the permission prompt. Google strongly recommends against showing permission prompt immediately after a user lands on a website. User should be asked for permission only when he has a fairly good idea of what the site is about. While asking for permission, context should be set and user should know what kind of notifications he will be getting. For e.g Before asking for permission, an e commerce website should ask the user if he would like to get updates on special offers. Here, the user knows what kind of updates he will be getting after granting permission. The user will unsubscribe from a specific category only and will not be forced to revoke his permission to stop the website from sending him any type of notifications. 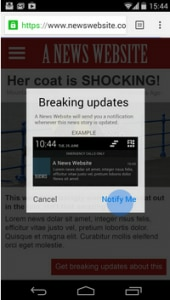 In future, the user may decide to get other types of updates as well from the website and turn them on. It is important to measure the acceptance rates of permission prompts and also to keep a track of the no. of users who revoke permission.